Firstly, thank you so much for the time you spared for our meeting on Friday, 07 December 2018 and for receiving the petition of the The Basamuk People’s Voice (BPV). As per your advice for a second meeting on Tuesday, 11 December, my attempts to meet were unsuccessful. On Friday, 14 December 2018 your official response to our petition was published in the media. Minister, we take your announcement to mean that you have dismissed our petition. On behalf of the landowners and the people of Rai Coast, and in the best of the State and the Developer, I request that you reconsider your decision. Minister, it seems you have been misled by individuals with vested interests. Your statements may have serious implications as some of them are in contempt of existing National Court Orders and breach of laws which I will explain further in this lengthy article. I ask for your patience, sir. The BPV consists of recognized landowners and mine-impacted communities in the area referred to as “Basamuk” in the Ramu Nickel Project. It consists of 5 Council Wards from Rai Coast Rural LLG. It also has membership of landowners from Astrolabe Bay Rural LLG, known as “Coastal Pipeline” in the project footprint and the whole of the Rai Coast. We are an interest lobby group, comprising of our educated citizens, working with our duly recognized Landowner Associations (LOAs) and the elected political leaders (Ward Members) at the Government closest to our people for the common interest and purpose of development for our District. We are members of the Basamuk LOA, Coastal Pipeline LOA, Astrolabe Bay LLG and Rai Coast LLG, who are all parties to the Memorandum of Agreement (MOA) relating to Ramu Nickel/Cobalt Project. Our development issues have not been adequately addressed through our Basamuk LOA organization, partly due to land ownership disputes which the State failed to address for over 17 years. More so, it has been due to the level of education, knowledge and the ability of our people to engage in such discussions in the past. Our political leaders at the national level have also failed to raise these genuine issues for 17 years. Therefore, we have organized ourselves to work with our LOAs, Wards, and LLGs to raise our concerns. Minister, your statement that we are illegitimate – “self-professed landowners”, and “people outside of mine impact areas posing as landowners” is misleading. The Project has various leases, from Kurumbukari in the Usino-Bundi District all the way to Basamuk in the Rai Coast District. Of course there are too many landowners! For Basamuk, most landowner identification has been completed and legitimate Landowners have been paid royalties for the first time in July 2018. 75% of the 1215 signatories to the petition are legitimate landowners for the existing and proposed extension project. Sir, the only lease at Basamuk that has dispute is the Lease for Mining Purpose No. 42 (LMP 42). All the disputing parties are landowners until the State hears the land dispute and declare the legitimate owners for compensation. As the spokesperson, I am a duly recognized landowner for my Clan’s Prency Land, which falls under Mining Easement No. 75. You just paid me royalty! I am also the Chair of the Binamel Incorporated Land Group (ILG), a group of LOs whose land is under a specific mining easement lease and are held by certain customary practices. The Lands Department had no issues registering our ILG some 10 years ago. For 17 years, most decision-making and the fight over the Chairmanship of the Basamuk LOA has been between the disputing parties of LMP 42. This has deprived the other genuine landowners from the limestone mine leases, and several mining easements from actively participating and discussing development issues through the LOA channel. Minister, we the landowners and the Rai Coast people have been deprived of our Constitutional rights “to have an equal opportunity to participate in, and benefit from the development of our country”. The memos of our National Goals and Directive Principles for “equalization of services in all parts of the country” and “equitable distribution of incomes and other benefits of developments among individuals” are yet to reach us. We’ve seen the PNG Government build billions of Kina worth of infrastructures in other parts of the country, and particularly Port Moresby, from Chinese grants and loans under China’s One Belt One Belt initiative. The Chinese Government have been here in Rai Coast for 13 years through its State-owned company MCC. Yet we have ZERO infrastructure for the people’s benefit. Our Constitution provides that “every person has the right of freedom of expression and publication”. It is our basic human right. Our demands for inclusion in development and access to basic rights like water, sanitation, medical services, education, infrastructure, transportation, a clean environment, conflict resolution, peace and safety is our basic human right. It is our right to demand for our rights when we’re faced with injustice and deprivation. Our rights need not be dismissed nor restricted to the communication channels. “I totally condemn the misinformation they are feeding the people through the media in their quest to create disharmony and distrust in the mining industry and the Government of Papua New Guinea” Minister Tuke. Our issues with the Ramu Nickel Project goes back 17 years. We deny the allegations that we have hidden agenda against the Government and the mining industry. We are just simple villagers who don’t push our weight around to get Government response and taxpayers’ money, unlike LOs from other resource projects. The K5 Billion Extension Project news triggered us to voice our genuine concerns. The 2019 National Budget and the MTDP III (2018 – 2022) does not have the Rai Coast road nor major infrastructures for Rai Coast. Sir, I categorically deny that I create distrust in the Government. Actually, the Rai Coast people themselves don’t have any more trust in the sweet promises of the Developer, the Project and the Government. For the Extension Project, the people’s trust must be won through the major capital investment like the road. The BPV petitioned the Government to address the land dispute as Gazetted in G169 of 2001, and again exempted from Government’s compulsory acquisition in 2002 (G51 of 2002). The Developer Ramu Nico Management (MCC) Ltd, in a paid Press Statement, on November 23 2018 also called upon the Government to have the matter resolved so they can establish better relationship with all stakeholders and fulfil their corporate social obligations. As per the IPA records, Sande Suang is not the legitimate Chairman of Basamuk Landowners Association (5-1025). The Developer indicated he instigates trouble. He first started instigating trouble after the LMP 42 land dispute was Gazetted in 2001. He misled Lands officials and obtained a State Agriculture lease over a piece of land already acquired for mining purpose. The motive for this was for him to be declared the land owner. The Developer MCC sued Sande Suang and his Ganglau Landowner Company. In two separate Court cases over the same fraud, the Court in both instances ruled that the State lease granted to Ganglau Landowner Company / Sande Suang null and void and squashed. The National Court directed: “the Secretary for Lands and the Registrar of Titles shall within 21 days amend all records of the State under their control to reflect the orders of the Court including amending the Register of State leases”. It is not known whether the Lands Secretary and the Registrar of Titles have amended their records. We believe the records have not been amended. Why is it taking the State over 17 years to correct a fraud, implement the Court Order, and do the people justice by establishing the necessary avenues to solve the land dispute? In its Press Statement of 23 November, 2018, the Developer MCC stated that Sande Suang has been causing various troubles. The latest was during the APEC Summit. MCC said it “categorically refutes all false allegations and claims by a certain individual with vested interest claiming to be Chairman of the so-called Basamuk LOA and the Limestone LOA, contained in Post Courier of Tuesday November 13 and Wednesday November 14 2018”. The Post Courier advertisements were carried out by Sande Suang, illegally claiming to be the Basamuk LOA Chairman. The BPV is not a landowner association. It is NOT one of the 3 different factions mentioned by MCC. For the first time, BPV brought the 3 different factions together to work towards resolving issues and voicing our concerns for better developmental outcomes for our people. Sande Suang seized the opportunity BPV created to gravely mislead you as he has his own vested personal interests. It is unfortunate that your officials have failed to do proper research. As per IPA records and a National Court Order, Sama Mellombo is the Chairman of Basamuk LOA (BLOA). The Mineral Resource Authority (MRA) conducted an election of LOA executives in 2016. The matter went to Court. The Court ruled that the election was unlawful and ordered a re-election. On 17 August, 2016 the Court recognised Sama Mellombo as the duly elected Chairman of BLOA. The same Order recognized BLOA Constitution, which was certified by IPA on 28/09/16. There is only one BLOA (IPA No. 5-1025). It is the only body represented in the MOA. The affairs of the BLOA must be managed according to the certified Rules of the Association, ie. the Constitution of the Basamuk Landowners Association, that is also upheld by the National Court. According to the Rules of the BLOA constitution, all general meetings of the Association must be chaired by the Chairman. It is the outgoing Chairman that chairs the election of new executives. The Court has already ruled that the election of BLOA executives chaired and conducted by the Government regulatory body Mineral Resources Authority (MRA) is unlawful. We understand MRA have also withheld grants to the BLOA since 2016. 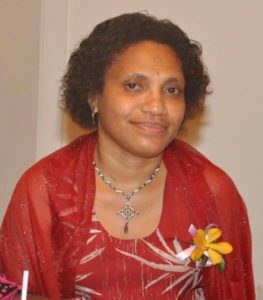 Very suspiciously, the Electoral Commissioner is said to in October 2018, through its Madang Office repeated the same mistake of chairing and conducting the election of new executives of BLOA. This is unlawful, illegal, and in breach of the Rules of the Constitution of BLOA. Minister, there has to be a Court Order, nullifying its earlier Order for you to declare Sande Suang as the Chairman of BLOA. The MRA and Electoral Commissioner do not have any powers to appoint themselves as Chairman of an Association (BLOA for this matter) and conduct elections as and when they want. We believe the State and its agencies like MRA, Electoral Commissioner and even the Developer avoid dealing with educated landowners. Obviously because we will ask for better deals and such issues as what we petitioned earlier. Instead, it deals with landowners with limited formal education so they can easily exploit and manipulate them. Sande Suang in his Press Statement of November 13 & 14, 2018 stated, and I quote: “We are simple landowners with limited formal education. I only have grade 6 formal education and am among a handful of landowner leaders with limited formal education”. Minister, Ramu Nickel Project’s Basamuk refinery is not situated on State land. Since 1942, the Titles were granted without identifying the land. The Basamuk land was never acquired even in the first place from its traditional owners and occupants to become Administration land, and later for Mining purpose, from the same customary owners. The landownership dispute at Basamuk over the Lease for Mining Purpose (LMP 42) is still unresolved to date. Special Land Titles Commission hearing headed by three (3) different Commissioners since 2002 have never resolved the matter. The last one even failed to adhere to a National Court Order directing the Commissioner to make the determination. The entry and occupation of Basamuk by the Developer MCC in 2006 was without a valid agreement due to the prolonged land dispute hearing. The State acquired Mindiri Portions 109 and 110, State Volume 27, Folio 142, containing an area of 87.859 hectares under the Compulsory Acquisition Process for public purpose (Mining) [Gazette No. G51 dated 28th March 2002]. NOT BASAMUK! Basamuk and Mindre are two different lands. In October 11, 2000, then Minister for Mining Hon. Moi Avei, MP, signed the Lease for Mining Purpose No. 42, clearly worded as: – “to the depth of 30m below the natural surface of the land situated near Basamuk, Madang Province”, under the Mining Act. The State acquired land near Basamuk, and fraudulently used the wrong survey map. Such State lease should be more descriptive, identifying the correct land. So our claim that the State never acquired Basamuk Land and that the State and Developer are illegally on our Basamuk Land is not “misinformation”. To add to the injustice, the State completely FAILED to hear us and resolve these issues for over 17 years! The protests of the traditional owners and occupants to the Department of Prime Minister and NEC in years 2000 and 2001 over the injustices described above over Basamuk Land has never been addressed to date. After 18 Years, we protest over the same issue again. The Minister for Mining, on behalf of the State, you have done us injustice again. The way forward is to deal with educated people. Minister, when our Petition deadline ceased on 19 December, I met with the 5 Ward Councillors, the BLOA Chairman and the BPV executives and resolved not to shut down the refinery. The Extension Project will not happen though. We are good peace-loving people. We want to do things legally and rationally for the good of everyone. We will however pursue the matter in Court if the State ignore us and continue the injustice. Sir, I am a well-respected leader in my community. My people listen to me. I stand for their interest, for the common good of the people. I kindly ask that you cease dealing with individuals like Sande Suang with personal interests and with disputes as it will spark further conflicts. The Government urgently set up a Review to look into the issues raised in our petition and others affecting the Ramu Nickel Project in January, 2019. The Review Team to consist of officials from relevant Government agencies like MRA, Mining Department, Provincial Affairs, National Planning, Treasury, Madang Provincial Administration and the Dept of PM & NEC. Following the Review, the Government set up the legal processes to resolve the land lease and dispute issues of the Basamuk LMP 42, identify traditional owners and pay them compensation as stipulated in our National Constitution. The Minister re-track his media statement of 14 December, 2018. Sande Suang is not the legally recognized Chairman of Basamuk LOA. He has personal vested interests as advised by MCC. He has misled you to make wrong media statements, a reputation risk you must manage. Deal with Mr. Sama Mellombo as the duly elected Chairman of Basamuk Landowners Association. BLOA is the only land owner association from Basamuk that is party to the MOA. Recognize Basamuk People’s Voice (BPV) as the voice of the people, the elected Ward Members, genuine landowners, ILG members and mine-impacted people. We are a NEUTRAL lobby group for development in our District. I ask that BPV be included in any Review work, together with the legally recognized BLOA, until the land disputes are resolved. Sir, thank you so much for reading this long letter. I ask that you consider the “way forward” recommendations above. Due to your media statement (based on misinformation), the Governor for Madang and our local MP are silent on our petition. That will not stop The BPV to continue our lobby activities until we get justice. Sir, I paul Pelpel Koii, chairman of land group( ILG no 160) would like to inform you the land title commissioner hearing in had been declared LMP 42, had been declared to my clan sibib the rightful ownership of the land.